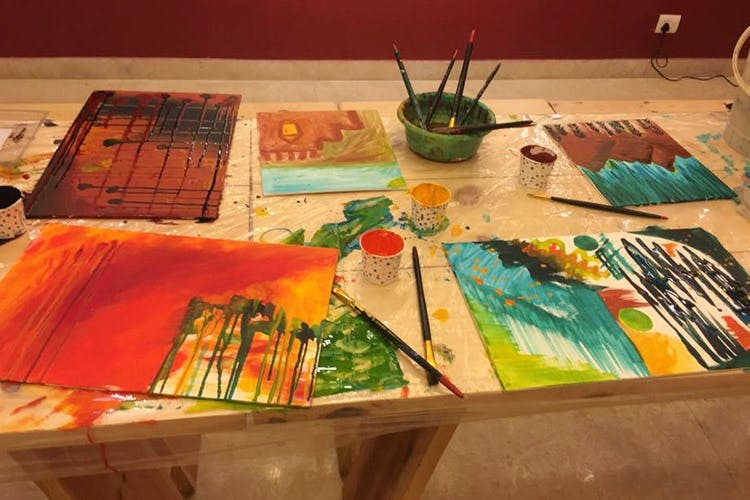 A woody, artsy space in GK, The Create Studio hosts hands-on art workshops with professional artists. It happily welcomes everyone from children to grandparents and you have the choice of committing long-term or going for a one off workshop. The forces behind the studio, Puja Bahri and Archana B. Sapra, have been an integral part of the art fraternity for years. Way before The Create Studio came into being, they formed arts4all.in, a self-sustaining, not-for-profit platform to support emerging artists, offer residencies, create public art, curate exhibitions and facilitate art education in general. So, opening up a studio space for everyone wanting to tap into their creative side was the next logical step. This well-rounded approach to promoting art, both professionally and at a micro level, has created a well-knit network of artists, curators, scholars, students and everyone who likes, appreciates and wants to understand art who now meet regularly. Unlike what we’re used to, The Create Studio isn’t a traditional art class where an in-house tutor teaches colony children how to make landscapes. It’s an open platform where art educators and field experts encourage participants to try something new. Airy and perfectly therapeutic, this space thrives on dialogue that’s intended to spark out-of-the-box thinking. A big part also involves a medley of workshops that don’t just focus on abstract or portraits but invite people for Picasso playdates or try their hand at cartoons, recycling, graffiti, impressionism, kitsch and even photography. Check them out on Facebook and plan a weekend family outing with mommy-poppy-baby-granny where everyone gets to see everyone else’s true colours. Way better than going to a mall, trust us.